Cocobolo Poolside Bar Grill is a hotel restaurant offering open-air western-style meat and seafood barbecue by an outdoor pool-side. Park hotel is located in the Clark Quay area tucked near Robertson Quay. 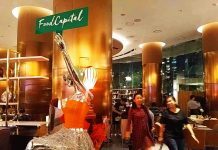 It is within walking distance from Clark Quay MRT station. 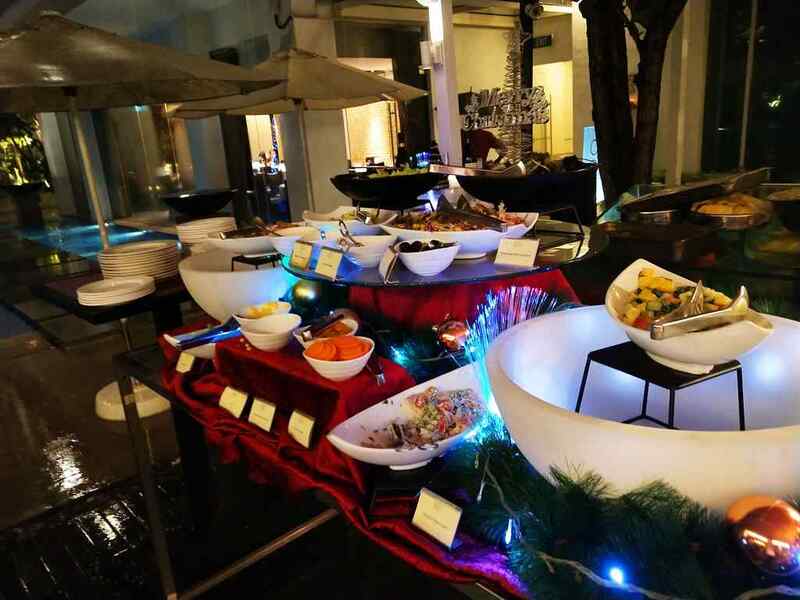 Welcome to Cocobolo, the open air poolside hotel buffet. An elevator ride up to the pool level on the second floor of the hotel building brings you right to the restaurant entrance by the hotel pool side. If you crave large slabs of beef steak or meats in general, you are in for a threat. 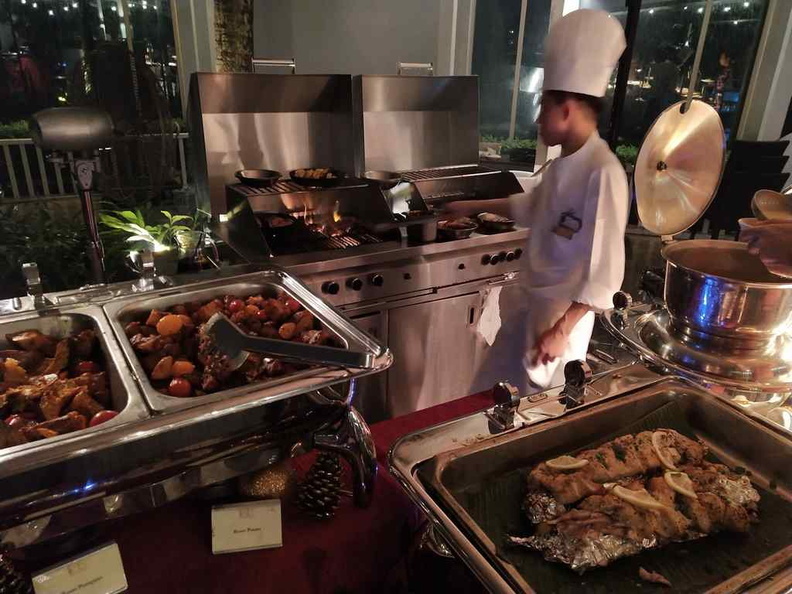 With extensive use of an outdoor barbecue, all the buffet main course items are cooked on-site in front of you. 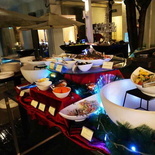 The open buffet meat dish spread, it is food galore! Furthermore, their meat steaks are prepared in large batches which reloads a serving platter. The quality of the food is generally good. The meats are grilled close to well done, but is otherwise still well marinated, tasty and juicy. 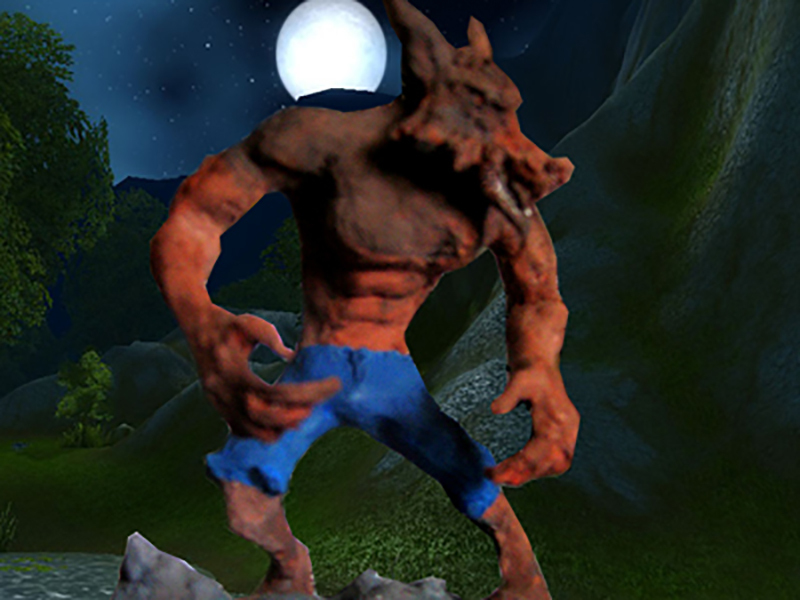 Notably, I noticed myself kept going back for more. You can watch your food being openly prepared from your table. This is useful to see when your food platters are replenished for more. However, sometimes some batches were inconsistent in how they were cooked. Some selections did appear too be too dry and overcooked to my liking. The open grill where you can see your food cooked by the hotel chefs behind the food counters. Food is regularly being replenished by staff, which was a great welcome even when nearing closing time. 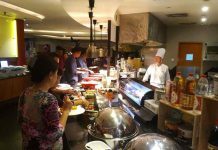 This is unlike other hotel buffets like triple three which has a limited replenishment on their food offerings. 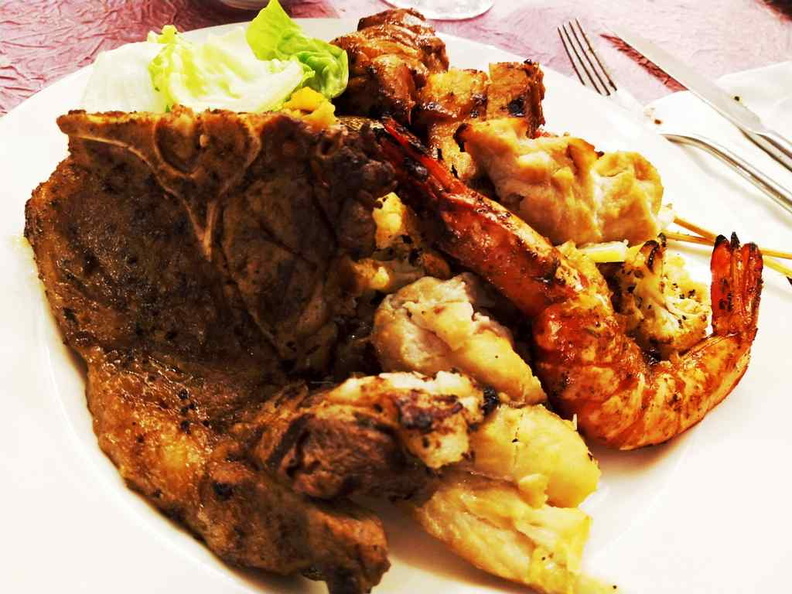 In addition to meats are a seafood and cooked food selection comprising of sea bass, squid and prawns. The seafood comprising of squid and prawns are fresh and well-cooked. Satays are also offered free-flow and best accompanied with their peanut satay sauce. Free flow of coffee and tea, as well as a salad area are provided if you need need a detox from all the meats. 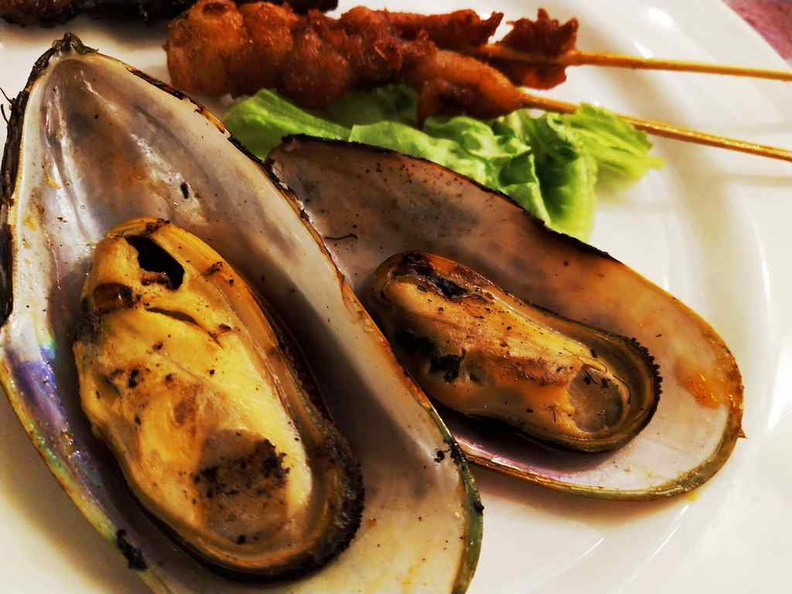 The BBQ seafood selection, including BBQ clams. Dessert selections includes a small. Salad bar, some fruits and an ice cream freezer bin. Ice cream choices includes pre-packed variants such as premium Magnum or Potong ice cream. 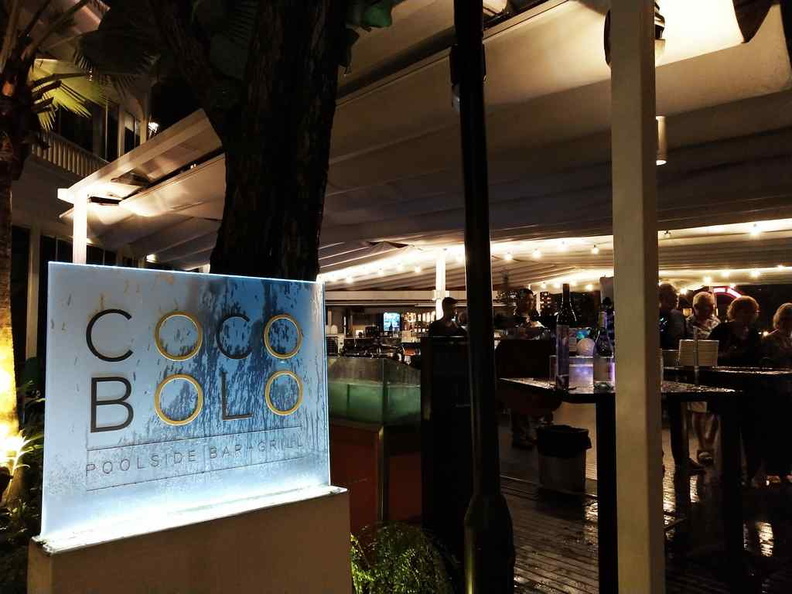 Additionally, Cocobolo has a small bar which offers cocktails and other alcoholic beverages, though it is not part of the buffet and a payable extra. If you crave a western meal, you are in for a treat. But don’t expect to find any Asian-style carbohydrates offerings such as rice, noodles or cooked vegetables. Notably, the buffet variety offered by Cocobolo is pretty small. 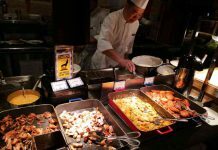 When dining at a hotel buffets, I always make a point to try out every single offerings in a rotation, and only return to dishes I had tried when I had exhausted all the offerings. However, here at Cocobolo, I saw myself having to revisit the food selections sooner than expected after doing a full round of all the available dishes. The spread here is one of the smaller ones I see for the price range of $70++ per diner. 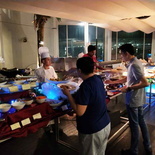 You have about 6 different meat and seafood choices spread over two tables, with an additional 2 tables for salad, drinks and desserts. There is only a small pasta offering. 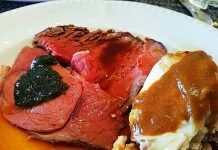 The large steak roast is a favorite of mine, I kept going back on my re-runs. In comparison, other international buffet selection offerings from Food capital (Grand Copthorne), Cavery or even the slightly more pricey Line at Shangri-la never had me having to revisit dishes on my rotation. However, having said that, you do get filled up really quickly here eating mostly only protein laden meats. 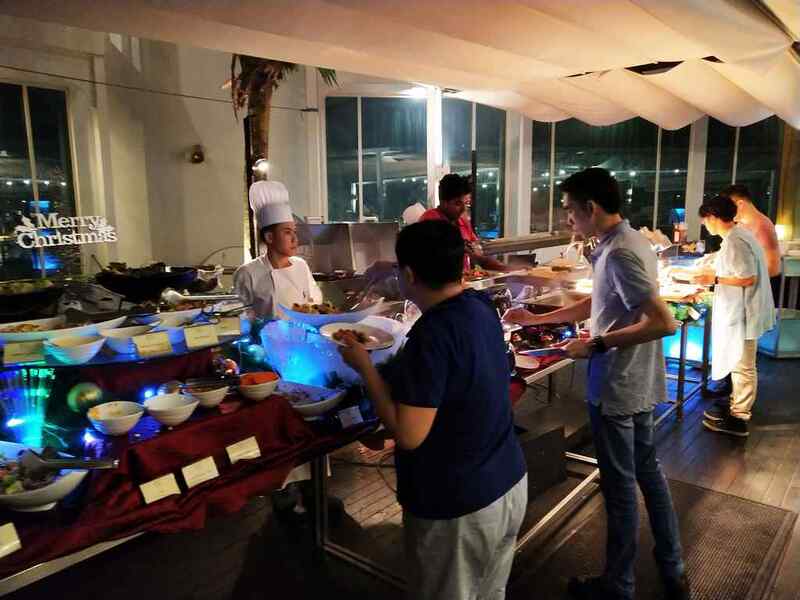 When it comes to value, come to think of it, you do get more value having a bottomless meat buffet here, then say ordering an equivalent three of 250 gram beef steaks from an a-la carte dine-in restaurant of roughly the same standard at $30 a serving. Additionally, to sweeten my visit further, the restaurant at times offers 1-1 dining deals through banks and credit cards. 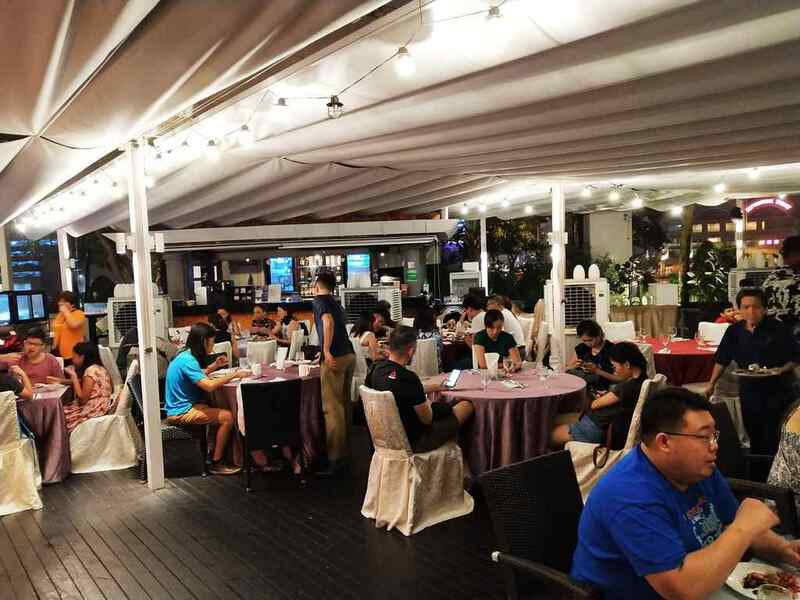 This brings about extremely good value for their offerings with their weekend BBQ Buffet dinner going at about $40 per adult after the discount with service charge and GST added. 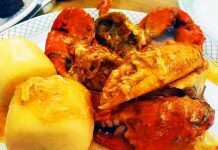 When first coming upon the idea of a pool side non air-conditioned dining in a restaurant, I was expecting to come out of it all sweaty, choking of barbecue smoke and smelling like oil after my meal. I am pleased to report that I experienced none of this. Moreover, the hotel did a good job in keeping the dining areas smoke-free. Surprising even with the outdoor and non air-conditioning seating the restaurant didn’t feel warm or smokey. Moreover, if it rains, the hotel has sheltered seating. 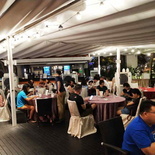 Though it could get rather cozy and at times stuffy with the tables already being cramped into the small poolside area. There are fans situated around the dining area to keep patrons cool, but not every diner gets to enjoy that. The dining areas are able to accommodate large dining groups of ten. But the let down is that it makes the restaurant pretty cramped with tables and seats squeezed within the confines of the pool wooden patio. 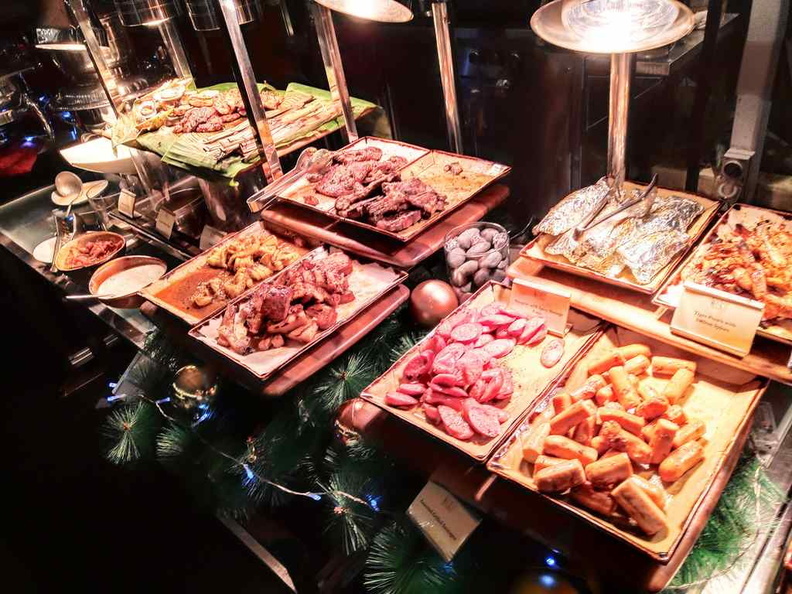 If you are just looking for a meat-lovers carnivore offering, other hotel alternatives you could consider includes more comfortable offerings like the Cavery at park hotel Alexandra, which I covered on previously. The large carnivorous spread, there is plenty of here to please both barbecue and meat lover fans. 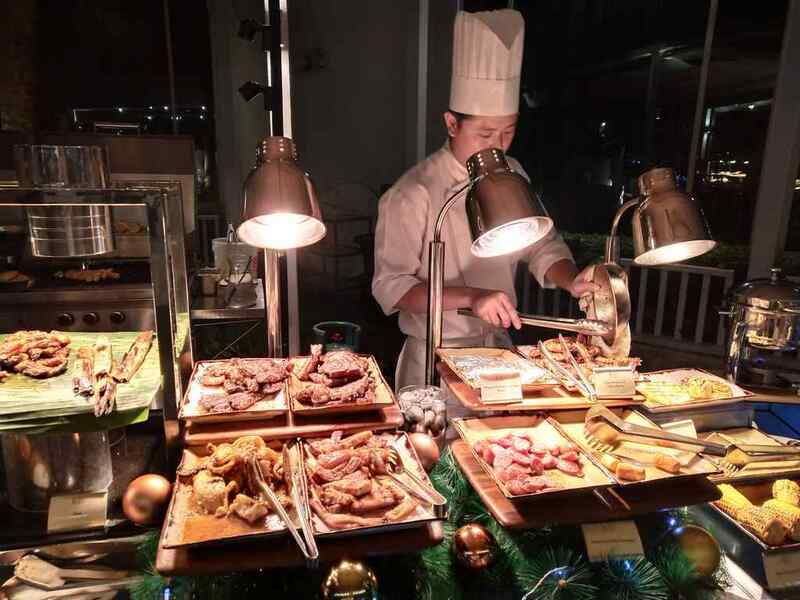 All in all, if you are looking for a barbecue buffet, Cocobolo Poolside Bar Grill offerings are pretty good value for money. There are however, many other good hotel dining alternatives on their price range which makes it hard for this establishment to stand out. I will recommend you to shortlist Cocobolo as a place for your meat fix, but no need to get too excited about it.